I thought about doing one or the other (or even both) of these styles of posts, but anything I thought to do seemed like a retread of other things already out there. Others got there before me, and, quite frankly, I don’t have anything new or original to add at the moment. So, Dear Reader, instead, I’ll be bringing you the 2012 GeekFluent Year in Review. For the second year in a row, I kicked off the 2012 “EMC Solutions for VMware” webcast series with a presentation titled “The Value of VMware Integration”. It wasn’t the last webcast I’d do in the series, but the last I’d do as an EMC employee (although I didn’t know that at the time). For me, the rest of January was filled with preparing for VMware Partner Exchange (PEX) and contemplating why we follow people on social media. In the beginning of the month, EMC officially announced the VFCache product (formerly known as Project Lightning). Later in the month, I went to Las Vegas and was in charge of the EMC booth on the VMware PEX Solutions Exchange. The conference was informative and fun, and I got to put my “forgiveness vs. permission” social media policy into action with Social Media Experiment #1. This was a month of change and transition for me. During this month I wrote two posts that have ended up being the most-read ones I’ve done so far: my write-up on “What Will VAAI v2 Do for You?” You can find them here: Part 1: Block and Part 2: NFS. This was a busy month, filled with new things. It started with learning that I’d been named to the VMware vExpert program. It was a humbling honor to be named to this community, and I continue to get value from my involvement there. Then, there came my biggest change in 2012, a job change. In April, I started work for Accunet Solutions, a datacenter solutons company, leading their Virtualization Practice. Since Accunet is a strong partner with both EMC and VMware, the transition has been a smooth and natural one. My role continues to expand and evolve, but remains tied to virtualization. Lastly, in a sort of social media experiment of another type, I became the only non-EMC employee to be the Community Manager of any of the forums on the EMC Community Network, the Everything VMware at EMC community. On the one hand, it was almost a non-event since I’d been managing this community since early 2010 as part of my job at EMC. On the other hand, it’s still different having an inside role while being outside. No insurmountable issues have arisen, and, overall, I have to say it’s been a very positive experience. This month found me back in Las Vegas for my first-ever EMC World as a non-EMC employee. I ran the Accunet Solutions booth on the Solutions Exchange, and it was very interesting to see this conference from the other side. 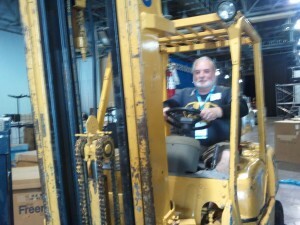 Me, driving a forklift at EMC World 2012. This month was the beginning of a shift at work. I started taking more of a leadership role amongst the engineers, leading a weekly strategy call. That weekly call continues to this day, and has built the go-to-market strategy that we’ll be launching in 2013. Do them in the order I listed. They build on each other. Spread them out over time. Don’t do them all at once like I did. This month was spent stepping outside my EMC and VMware comfort zone and starting a deeper dive into the product offerings of our other vendor partners. Among other things I did, I took the McAfee ACE training — a very hands-on technical deep dive. I started off this month with a return to the EMC Solutions for VMware webcast series. James Walkenhorst (@walkjaw) of EMC Isilon and I co-presented on Advanced Isilon OneFS Integration with VMware vSphere. It was a great experience. We got to show the first-ever public demos of VAAI running on Isilon. This month was a mix for me. I spent it simultaneously getting more involved in the Marketing side of my weirdly-hybrid job, and in getting more deeply integrated into some of our customers’ environments. I’ve always been a proponent of technical folks having regular contact with the folks who actually use the things they work on — the perspective it provides is priceless. This particular Certification Quest included my spending a week in Chicago taking the EMC RecoverPoint Specialist training, and then taking a number of exams in a smaller number of days up against a hard deadline. That number of days was then cut even shorter as Hurricane Sandy and various paperwork errors reared their ugly heads. In the end, it all worked out and we emerged victorious, with Accunet Solutions achieving the Consolidate Specialty in our partnership with EMC. I’ve written about the experience in depth here (including more detail in the comments), so I’ll add only this here: joining together to accomplish things like this as a group can really pull a team together. If I still had any “New Guy” about me with the other engineers, Certification Quest put an end to it. This month had me getting more deeply involved with more customers and prospects, getting on the phone, attending site visits, and writing proposals. In November, EMC also announced the launch of the EMC Elect Program. I was completely honored and humbled to have been named as one of the ten founding members of this new recognition program. Look for more details on this in 2013. I spent the first week of December in New York City taking the Centrify technical training. I’m impressed with the product suite, and with what I know about the new functionality they’ll be releasing in the new year. The rest of the month has been divided between getting back into getting hands-on at customer sites, and spending more time developing our go-to-market strategy for 2013. It’s been a lot of work, but I’m really happy with what we’ve got and am looking forward to rolling it out at our upcoming Kick-Off. It’s been a great year with a lot of changes and a lot of motion. A lot of great stuff has come my way in 2012, and I look forward to more in 2013. Both the GeekFluent readership and my Twitter followership have seen great growth through it all, and I’m very grateful. I’ll be working to bring more good content more often in the months ahead. Best wishes to all of you for a very Happy New Year. This entry was posted in General and tagged 2012, EMC, Me, Retrospective, VMware, VMwarePEX, Webcast. Bookmark the permalink.